This is the ramen I had been searching for. Only about a week and a half into my eating quest, I knew after one bite that Ôita Hôrai (loosely, Ôita Treasure House) had taken the top spot and would be a tough act to follow and an even tougher one to dethrone. 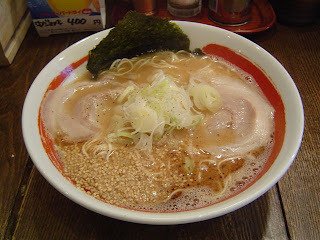 I was biking down Waseda-dori halfway between the Babakuchi intersection and the Takadanobaba train station when the words Ôita, tonkotsu, and ramen splashed out in big red and black letters caught my eye and I slammed on the brakes and screeched to a halt. Unfortunately, I had just eaten and knew that my mostly full stomach couldn't do justice to what promised to be a memorable bowl of ramen. Almost exactly six years ago, I took my first and so far only trip to the island of Kyushu, and, after several days of hiking in the mountains, traveled to the city of Oita in the north of the island, where I visited a friend and replenished myself with delicious ramen. At that time, I didn't know much about ramen, but I knew that the best stuff came from Kyushu, so I was determined to have a quality bowl while there. A local poolshark friend of a friend took us to a tiny hole in the wall, and I slurped down every last drop of soup. Until that time, I had never really been careful or choosy about what ramen to eat, just stopping into whatever shop was closest. But after that bowl I knew what ramen could be and the bar had been forever raised. Now, six years later, I had found a rare Ôita style shop right in my neighborhood. Could it compare to my sacred memory? I would have to wait to find out. A couple days later, as soon as convenience allowed, I went back to Ôita Hôraiken with a few classmates. Surprisingly, it's a two-story shop inside, but we sat at the counter downstairs in front of the action. The menu is almost shockingly huge, with shio tonkotsu, shôyû tonkotsu, and miso tonkotsu, in addition to straight up Ôita-style porky goodness. In addition, the "basic" comes in various permutations and combinations of onions, garlic, extra spice, and extra sesame. This ramen was delicious. It was exactly what I wanted it to be. Extra Kyushu-appropriate toppings were available tableside, like beni shôga (red pickled ginger) and piri-kara takana (spicy mustard greens) to make the complete Kyushu-style bowl. To be honest, I'm not totally sure what the difference is between Ôita-style and the more famous Hakata-style ramen, but at that moment, I didn't care. The soup was rich, powerful, and totally satisfying, if quite oily. Definitely the kind of place that leaves a film in your mouth afterwards, but a small price to pay. 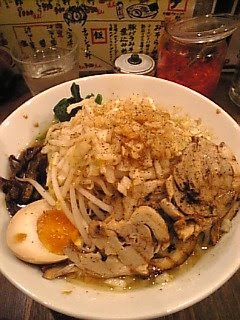 Naturally, the noodles were thin and straight, in classic Kyushu style. I got an order of rice and dumped it in the bowl to finish off every last drop of the soup. My itch had been scratched, and as of the date of this posting, I still have yet to find a bowl of ramen to equal this one. This is by no means to say that Ôita Hôrai is the best ramen in Baba, merely that it is the ramen that, so far, best fits my personal preferences. 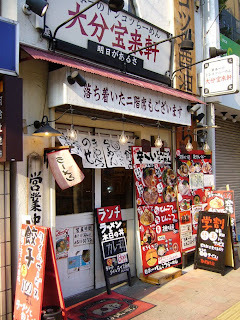 I went back about a week later to try their "super ramen" (I think they call it marutoku?) which had thick futomen noodles, which is a real rarity at Kyushu-style shops which generally only serve up very thin white hosomen noodles. Although I would call Hakata-style ramen my favorite, I do generally prefer the thick noodles, so I had to try this rare bird. As an added bonus, they offer a 100 yen discount with a student ID.